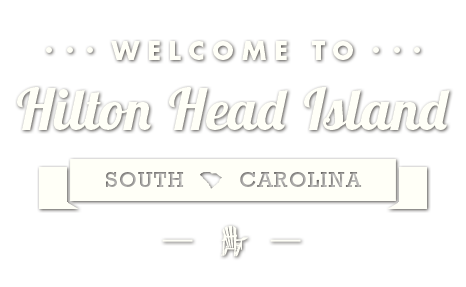 No matter which way you wear it, Hilton Head style is always in fashion. 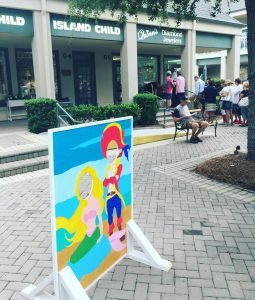 Shopping at our local stores is a great way to find the perfect Island style, and these are some of the hot spots you won’t want to miss on your next Hilton Head Island shopping trip. If Hilton Head had a downtown, this would be it. 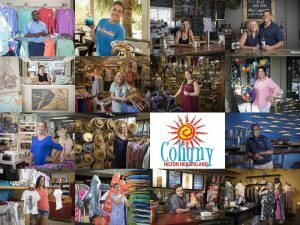 Not only does Coligny have a beach market, steps away from the sandy shoreline, but it also has a whole center full of shops across the street. 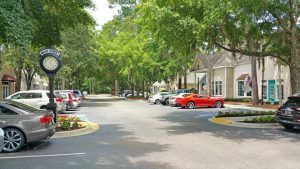 Home to over 60 shops and restaurants, a movie theater, great live entertainment and events, Coligny has everything you need to have a fabulous time. 1 N. Forest Beach Dr. (843) 842-6050. colignyplaza.com. 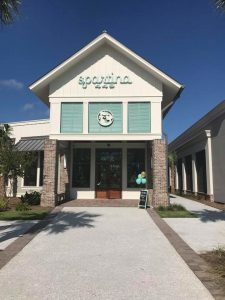 Sea Pines doesn’t just have one shopping destination, but three! While South Beach boasts the beach and the Salty Dog Cafe, Harbour Town is home to the island’s most famous landmark – the red-and-white-striped lighthouse – right off the Calibogue Sound. There’s also the Sea Pines Center, which offers a diverse ambience with decorative accessories, antiques, vintage shops, boutiques and resort wear. Harbour Town: 149 Lighthouse Rd. (866) 561-8802. seapines.com. South Beach: 232 S. Sea Pines Dr. seapines.com. Sea Pines Center: 71 Lighthouse Rd. theshopsatseapinescenter.com. Enjoy an old-fashioned downtown shopping experience at a selection of locally-owned and operated merchants, restaurants, and service-oriented businesses. With a grocery store, pharmacy, medical services, banks, art galleries, a liquor store, apparel, gift shops and more, Main Street Village has it all. 1500 Main St. (678) 424-1325. mainstreetvillagehhi.com. Hilton Head’s newest shopping destination, Shelter Cove Towne Centre, doesn’t just boast beautiful views of Broad Creek, but a handful of fantastic shopping and dining options. Right next to the Towne Centre is The Plaza at Shelter Cove, which offers great retail stores as well as liquor and a Whole Foods Market. It’s a great place to finish your errands without running all over the Island. Finally, there is Shelter Cove Harbour, which has boutiques, art galleries and everything from Mexican to Mediterranean food. The Harbour also boasts boat tours and watersports operating out of the marina. With its vast array of options, Shelter Cove is the perfect place for locals and visitors alike. Shelter Cove Towne Centre: 40 Shelter Cove Ln. (843) 686-3090. sheltercovetownecentre.com. The Plaza at Shelter Cove: 50 Shelter Cove Ln. (704) 804-5801. theplazaatsheltercove.com. Shelter Cove Harbour: 1 Harbourside Ln. (800) 516-1277. palmettodunes.com. If you’re looking for brand names and a place to spend your entire day shopping, then look no further. The Tanger Outlets on Hilton Head have more than 85 stores in their two locations off of Highway 278. Boasting such brands as Nike, Kate Spade and many more, the Tanger Outlets are sure to have that perfect something you’re looking for. Tanger 2: 1256 Fording Island Rd., (843) 837-5410. tangeroutlet.com/hiltonhead. Tanger 1: 1414 Fording Island Rd., Bluffton. (843) 837-5410. tangeroutlet.com/hiltonhead. The Village at Wexford, located on William Hilton Parkway near Mile Marker 10, offers visitors a quaint shopping experience with specialty shops, art galleries, a spa, restaurants and more. With 30 of the best stores and restaurants in the Hilton Head and Bluffton area, The Village at Wexford is a must-stop shopping destination. 1000 William Hilton Pkwy. villageatwexford.com.